The repliQa™ HiFi Assembly Mix simplifies the construction of recombinant DNA through scarless assembly of multiple DNA fragments in a single, isothermal reaction. Three DNA fragments containing 23 bp overlaps were generated by PCR, DpnI treated umn purified. The three fragments, 4.2 kb, 3.1 kb, and 400 bp in size, were combined in a 1:1.4:5 molar ratio. Total DNA quantities used are indicated (x-axis) and reacted at 50 °C for 60 minutes according to the protocol. One microliter of the undiluted assembled products or one microliter of a 4-fold dilution of the assembled products was used to transform 30 μl of chemically competent cells. PCR fragments containing 30 bp overlaps were DpnI treated, purified, and assembled according to the protocol. PCR fragments containing 30 bp overlaps were DpnI treated, purified, and assembled according to the protocol. Reactions contained the indicated number of DNA fragments (0.1 pmol each) and were incubated at 50 °C for 60 minutes. 1 ul of the reactions were used to transform 30 µl of chemically competent cells. I highly recommend repliQa HiFi Assembly Mix over other products. The difference is the 10x formulation. 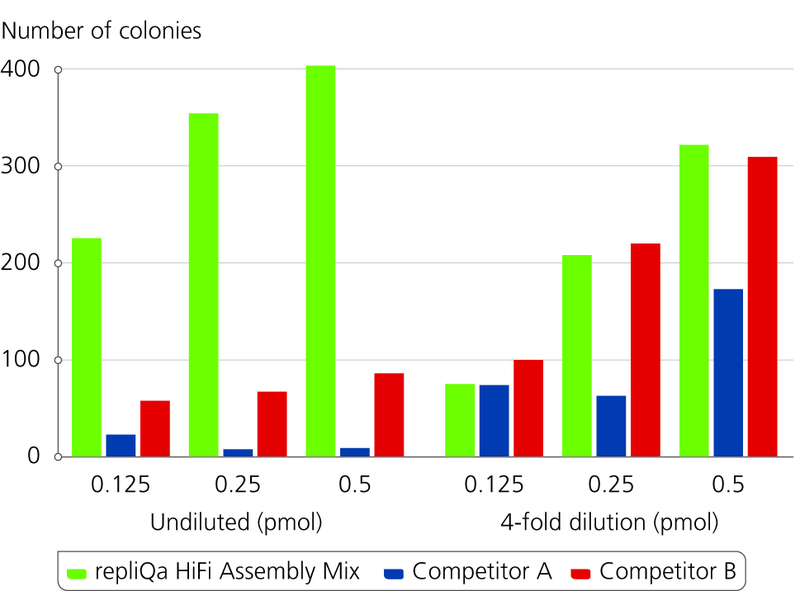 repliQa HiFi Assembly Enzyme Mix Optimized formulation of enzymes for 5’-end resection, high fidelity 3’- end extension, and nick sealing. DpnI (20 U/μl) Restriction endonuclease for the (optional) post- PCR digestion of residual unamplified plasmid template. Store kit components in a constant temperature freezer at -25°C to -15°C upon receipt. For long term buffer storage (> 30 days) store buffer at -70°C. Refer to the product label or lot-specific Product Specification Sheet (PSF) for applicable expiration date. What is the recommended amount of sequence overlap? 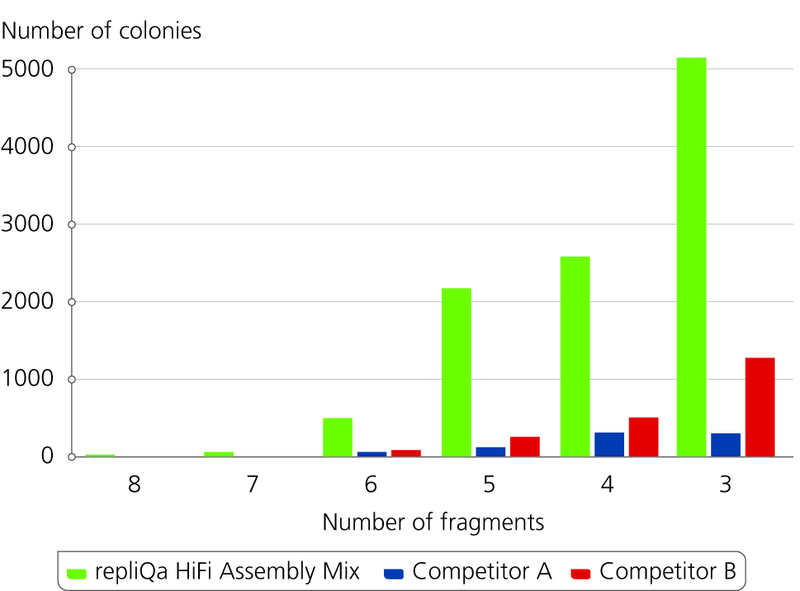 The repliQa HiFi Assembly Mix is optimized for assembly of fragments with overlap regions between 15 – 60 bp. Is it necessary to purify the PCR fragments that will be used in the assembly reaction? Purification of PCR product using a spin column-based cleanup or other method is not required but is highly recommended to achieve highest efficiency fragment assembly. What are the advantages of the repliQa HiFi Assembly Mix for cloning? The repliQa HiFi Assembly Mix allows simultaneous cloning of multiple insert fragments into vectors without creating scars. In contrast to traditional cloning, there is no requirement for restriction endonucleases and unique restriction sites. Is there a preferred method for transforming E.coli with the assembled DNA? The products of the repliQa HiFi Assembly reaction can be introduced into E.coli either by chemical transformation or electroporation. If electroporation is to be used for transforming cells, we recommend first diluting the assembly reaction 1:5 in high purity water. When should the DpnI be used? 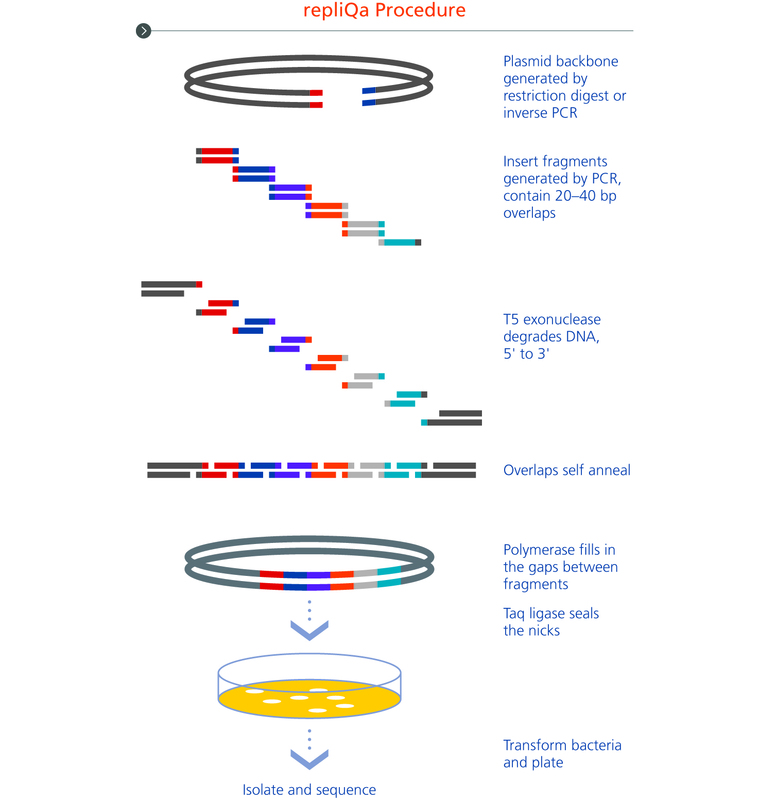 If plasmid DNA is used as PCR template for generation of fragments for assembly, it is recommended to treat the PCR reactions with DpnI prior to the assembly reaction to eliminate residual methylated plasmid that could give rise to colonies lacking the assembled product of interest.